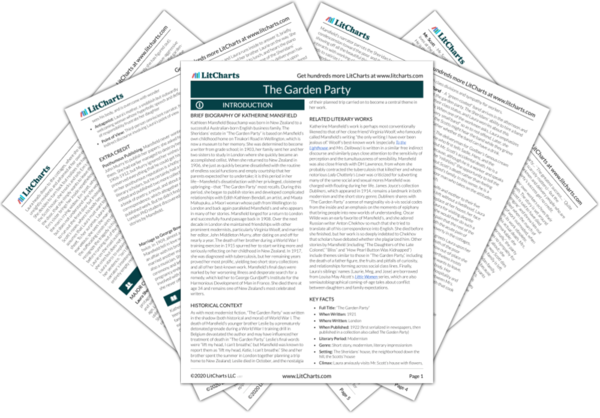 Instant downloads of all 945 LitChart PDFs (including The Garden Party). 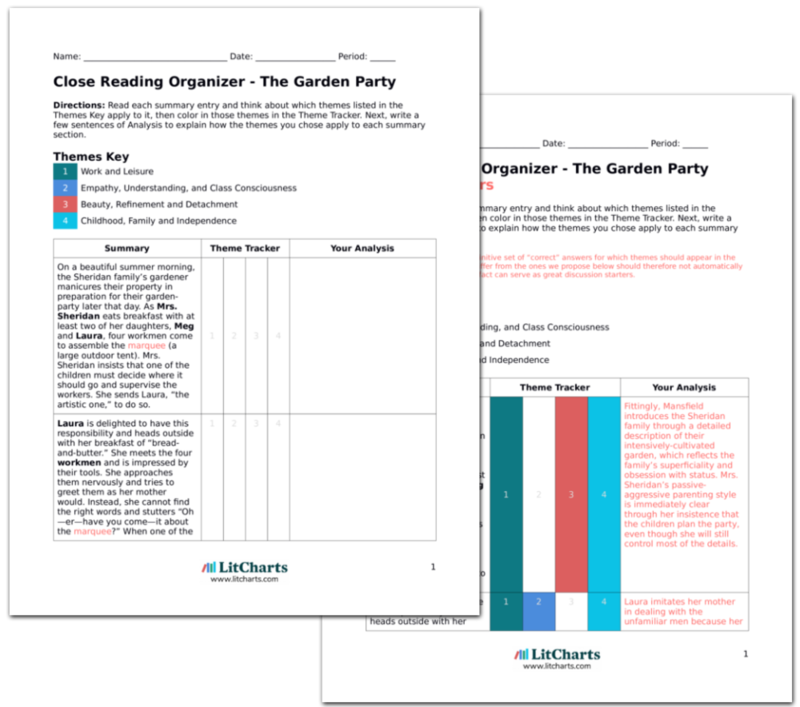 Welcome to the LitCharts study guide on Katherine Mansfield's The Garden Party. Created by the original team behind SparkNotes, LitCharts are the world's best literature guides. A concise biography of Katherine Mansfield plus historical and literary context for The Garden Party. A quick-reference summary: The Garden Party on a single page. In-depth summary and analysis of every of The Garden Party. Visual theme-tracking, too. Explanations, analysis, and visualizations of The Garden Party's themes. The Garden Party's important quotes, sortable by theme, character, or . Description, analysis, and timelines for The Garden Party's characters. Explanations of The Garden Party's symbols, and tracking of where they appear. An interactive data visualization of The Garden Party's plot and themes. Kathleen Mansfield Beauchamp was born in New Zealand to a successful Australian-born English business family. The Sheridans’ estate in “The Garden Party” is based on Mansfield’s own childhood home on Tinakori Road in Wellington, which is now a museum to her memory. She was determined to become a writer from grade school; in 1903, her family sent her and her two sisters to study in London where she quickly became an accomplished cellist. When she returned to New Zealand in 1906, she just as quickly became dissatisfied with the routine of endless social functions and empty courtship that her parents expected her to undertake; it is this period in her life—Mansfield’s dissatisfaction with her privileged, cloistered upbringing—that “The Garden Party” most recalls. During this period, she began to publish stories and developed complicated relationships with Edith Kathleen Bendall, an artist, and Maata Mahupuku, a Maori woman whose path from Wellington to London and back again paralleled Mansfield’s and who appears in many of her stories. Mansfield longed for a return to London and successfully found passage back in 1908. Over the next decade in London she maintained friendships with other prominent modernists, particularly Virginia Woolf, and married her editor, John Middleton Murry, after dating on and off for nearly a year. The death of her brother during a World War I training exercise in 1915 spurred her to start writing more and seriously reflecting on her childhood in New Zealand. In 1917, she was diagnosed with tuberculosis, but her remaining years proved her most prolific, yielding two short story collections and all of her best-known work. Mansfield’s final days were marked by her worsening illness and desperate search for a remedy, which led her to George Gurdjieff’s Institute for the Harmonious Development of Man in France. She died there at age 34 and remains one of New Zealand’s most celebrated writers. 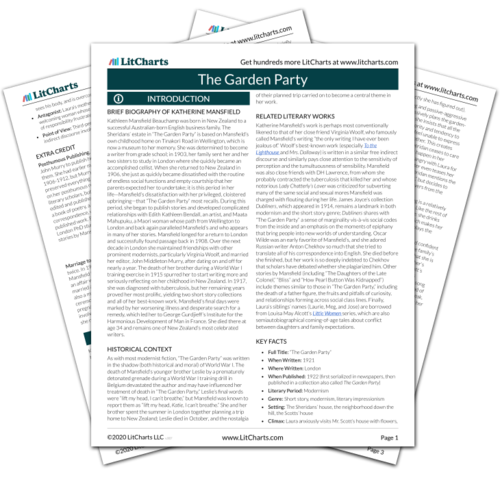 Get the entire The Garden Party LitChart as a printable PDF. As with most modernist fiction, “The Garden Party” was written in the shadow (both historical and moral) of World War I. The death of Mansfield’s younger brother Leslie by a prematurely detonated grenade during a World War I training drill in Belgium devastated the author and may have influenced her treatment of death in “The Garden Party.” Leslie’s final words were “lift my head, I can’t breathe,” but Mansfield was known to report them as “lift my head, Katie, I can’t breathe.” She and her brother spent the summer in London together planning a trip home to New Zealand; Leslie died in October, and the nostalgia of their planned trip carried on to become a central theme in her work. Katherine Mansfield’s work is perhaps most conventionally likened to that of her close friend Virginia Woolf, who famously called Mansfield’s writing “the only writing I have ever been jealous of.” Woolf’s best-known work (especially To the Lighthouse and Mrs. Dalloway) is written in a similar free indirect discourse and similarly pays close attention to the sensitivity of perception and the tumultuousness of sensibility. Mansfield was also close friends with DH Lawrence, from whom she probably contracted the tuberculosis that killed her and whose notorious Lady Chatterly’s Lover was criticized for subverting many of the same social and sexual mores Mansfield was charged with flouting during her life. James Joyce’s collection Dubliners, which appeared in 1914, remains a landmark in both modernism and the short story genre; Dubliners shares with “The Garden Party” a sense of marginality vis-à-vis social codes from the inside and an emphasis on the moments of epiphany that bring people into new worlds of understanding. Oscar Wilde was an early favorite of Mansfield’s, and she adored Russian writer Anton Chekhov so much that she tried to translate all of his correspondence into English. She died before she finished, but her work is so deeply indebted to Chekhov that scholars have debated whether she plagiarized him. Other stories by Mansfield (including “The Daughters of the Late Colonel,” “Bliss” and “How Pearl Button Was Kidnapped”) include themes similar to those in “The Garden Party,” including the death of a father figure, the fruits and pitfalls of curiosity, and relationships forming across social class lines. Finally, Laura’s siblings’ names (Laurie, Meg, and Jose) are borrowed from Louisa May Alcott’s Little Women series, which are also semiautobiographical coming-of-age tales about conflict between daughters and family expectations. Posthumous Publishing. Mansfield never wanted her husband John Murry to publish her papers; she asked him to dispose of them. She had earlier managed to destroy her journals from 1906-1912, but Murry ignored her wishes and meticulously preserved everything that he could get his hands on. His effect on her posthumous reputation is a hotly-debated topic among literary scholars, but he certainly had a significant one: he edited and published two more collections of her short stories, a book of poetry, a novel, and about a half-dozen books of correspondence, which altogether comprise the majority of her published work. But he didn’t find everything: in 2012, a London PhD student discovered four previously unknown stories by Mansfield. Marriage to George Bowden. Mansfield actually married twice. In 1909, almost a decade before she married Murry, Mansfield fell in love with a musician who spurned her. She had an affair with his brother, got pregnant, and then suddenly married another man altogether: George Bowden, who was also a musician. She purportedly wore a funeral dress to the ceremony and left Bowden forever after only a few hours. The pregnancy ended in miscarriage, and Mansfield was also involved with her closest friend and fellow writer Ida Baker, but she never officially divorced Bowden for eight years. Jennings, Rohan. "The Garden Party." LitCharts. LitCharts LLC, 31 Mar 2018. Web. 23 Apr 2019. Jennings, Rohan. "The Garden Party." LitCharts LLC, March 31, 2018. Retrieved April 23, 2019. https://www.litcharts.com/lit/the-garden-party.